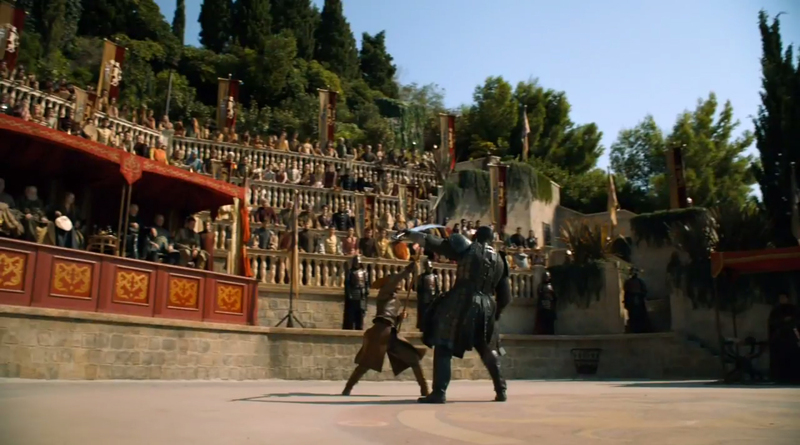 As with every season, the last two episodes of Game of Thrones have really picked up the pace as we head down the season's home strait and it brings us here, to a clash that has been touted right from the opening episode; Oberyn Martell versus Gregor Clegane. There are plenty of other things going on in The Mountain and the Viper though before we get to that titular confrontation. Built around alliances and adversaries, the episode features mainly scenes focused mainly on the relationships between two characters or, in the case of the Wall-set moments, two groups at war with each other. It's an excellent thematic device, strengthening the dynamics between characters or in some cases, shattering them completely. It also builds well into the foreboding of the episode as we see the uneasy status quo of this season break down even further. The opening scenes in Molestown set up a brutal tone for what is to follow, a dingily-lit rout of the citizens within as well as some unfortunate Crows who happened to be breaking the rules that night. A lot of the scenes at the Wall this season have felt a lot like padding, as I've mentioned before, but here, it is all forward momentum as the wildlings close in. The fast pace and editing of the scene leaves a little to the imagination as deaths happen in a reflection in a well or shadows against the wall, but there is a handy bit of gore as blood drains through floorboards whilst Gilly looks on. It also is at pains to point out that Ygritte still isn't an out and out villain in a world full of murky grey morality, allowing Gilly and her child to live and advising them to keep quiet. The following scenes with Missandei and Grey Worm's burgeoning relationship temper the violence a little and although it perhaps goes on a little longer than necessary, it's a nice continuation from the language lessons we saw earlier in the season. Game of Thrones often breaks off for little asides with minor characters often and it works well, reminding the audience of the larger world around the main players. However, it is the later scenes with Dany, in which she discovers Jorah's betrayal, that pack a more emotional wallop. Emilia Clarke has been given little to do but look imperious and bark orders. Here, she portrays Dany's betrayal brilliantly, all hurt and quiet fury. Iain Glen too brings a noble man to his knees with Jorah, desperation creeping into his otherwise measured and assured actions. It's a fleeting yet significant moment, scored beautifully as ever, fracturing one of the longest standing relationships in a matter of seconds. In contrast, the scenes in the Vale saw a new alliance form, born out of the desire for mutual self-preservation. The swift dispatch of Lysa in the previous episode left Littlefinger in the frame as he had only just married and looked for all the world like the kind of power-hungry creep he is. The court scene saw him flounder in the face of questioning, leaving it to Sansa to rescue her protector and prove herself adept at playing the political game. It's a showcase for Sophie Turner from the moment she enters, allowing her to play up the tortured heroine side of Sansa's character whilst also demonstrating her knack for manipulation. By the end of the episode, she has not necessarily proven herself equal to Littlefinger's kingdom-spanning scheming, but she's certainly a worthy apprentice. Alongside this, we also get Arya and the Hound finally getting to the Bloody Gate, only to discover that Arya's aunt is now dead and therefore a ransom is unlikely. Arya really does have the worst luck of pretty much anyone in the show and in a wonderful, maniacal giggle, Maisie Williams channels that frustration and disbelief brilliantly. It's a moment of black humour but one undercut with a tangible sense of tragedy. After everything, Arya finally broke a little. Speaking of being broken, Alfie Allen's performance as Reek has been sublime from the opening of this season. Here, Reek is asked to don his Theon armour again and take back Moat Cailin (appearing in the opening credits for the first time). His delivery as Theon is stilted and rehearsed, further demonstrating that he has become Reek and nothing else now. We also get to see Ramsay Snow legitimised by his father and become Ramsay Bolton. I'm going to go out on a limb and say that's probably not going to do anything to curb the violence. As a Lannister, Jaime's allegiances within his family have shifted constantly. With his relationship with Cersei all but over, he has been bonding with Tyrion. Their jail-based conversations have been tinged with a melancholy understanding of each other's predicaments and Nikolaj Coster-Waldau and Peter Dinklage have an easy fraternal chemistry that makes them all the more enjoyable. The glimpse back to their childhood here finds Tyrion contemplating the easy ability with which beetles can be squashed by someone much larger. A neat bit of foreshadowing to the battle ahead, Dinklage performs this monologue with all the wit and passion he possesses. This season, he has been continually excellent as his character is backed further and further into a corner and he's still set to face his biggest obstacle yet, thanks to the mutually assured destruction of the fight between the Mountain and Oberyn. And so we come to the titular battle, a showdown between one man out for vengeance and the killing machine responsible for the death of his sister, Ellia. The episode teases this clash out an extraordinary amount to the point where it is left with just five minutes or so of the episode in which to get its work done. Thankfully, that five minutes is probably among the best action sequences the show has ever produced. The second Oberyn twirls into the arena, the battle ceases to be about Tyrion's freedom and becomes all-consumed with Oberyn's chance for revenge. In a big nod to that other vengeance-fuelled character, Inigo Montoya, Oberyn circles his prey repeating "you raped her, you murdered her, you killed her children" over and over again. The fight scene was impressive for a number of reasons, not in the least Pedro Pascal's brilliant performance as Oberyn goes from cocksure hero to a bloody mess in mere minutes. The casting directors and the writers have been particularly mean with Oberyn, because Pascal's performance has been so good that everyone just fell in love with him, myself included. He was sassy, he took no crap and looked every bit the champion in the arena. Of course, everyone should have known not to get too attached. The direction of the clash, assuredly handled by Alex Graves, captured the ebbs and flows of the fight well ensuring that, if you didn't know what was coming, you probably would never have guessed. The choreography was also stunning, using the characters to provide them with fighting styles that reflected on them and their upbringing; whereas the Mountain was all bluster and large blows, Oberyn's movements were fluid and fast. The manner of his death was particularly violent, yet another memorable moment to add to the collection that began for most people with Viserys' 'golden crown'. It's not like anyone really needed reminded after the sword-in-mouth death of Kurt, but King's Landing is just as bloody and just as brutal as ever. With the next episode the ninth in the season (we all know what means), the stage is set for some Neill Marshall-directed carnage as the wildlings finally reach Castle Black. You can read Becky's review of The Laws of Gods and Men here.